I found a recipe for an amazing asparagus dish. I made it the other day. I made it again today. Modified. Yummy. These are a few of my favorite things – I hope that song stays stuck in your head! 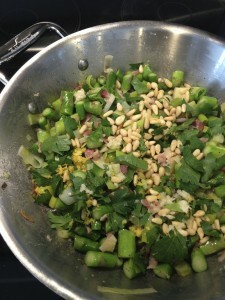 Bacon, asparagus, leeks, lemon zest, pine nuts, garlic, Italian parsley, salt and pepper. Fry the bacon, add a bit of butter then add asparagus and leeks, cook them a bit add the rest of the stuff, cook for a few and serve. I ate this with a bit of jasmine rice. My body loves me, well except my legs. They hate me, they hate crossfit. I laugh and wobble like a weeble.